Welcome to the first episode of the CodingTheSmartWay.com Machine Learning Crash Course For Beginners! In this series you’ll learn everything you need to get started with Machine Learning from scratch. No prior knowledge is required. You’ll learn basic concepts and practical applications from start to finish. In this first episode we’ll start to clarify what Machine Learning exactly is, how it is linked to terms like Artificial Intelligence and Deep Learning and what different types of Machine Learning are available. We’ll also take a look at Google Colaboratory (Colab) which is a Python-based Machine Learning development environment in the cloud. In the context of Machine Learning people often talk about Artificial Intelligence and Deep Learning. So let’s see how these terminologies relate to each other. The most comprehensive term is Artificial Intelligence. Artificial Intelligence is a field in computer science that aims to make computers achieve a human-style intelligence. Machine Learning is then located within the area of Artificial Intelligence and describes a set of techniques which are used to train a computer to perform a certain task without providing the exact algorithm which is needed to solve that task. Deep Learning is a sub-field of Machine Learning. In Deep Learning multi-layered neural networks are used to perform machine learning tasks. This is at the same time the reason why it is called “Deep” Learning. The term deep refers to the number of layers in the neural network through which the data is transformed. In general Supervised Learning is describing the learning process when the computer knows what to learn. That means that the input data which is provided to train a neural network is labeled. With the labels provided the computer knows what the correct answer would be. A typical example of that type of learning is an image recognition task. For training the neural network images are provided which are labeled, so that the neural network knows what is shown on the images. E.g. you can think of images showing cats and dogs and those images are labeled with “cat” or “dog. Providing the set of training data makes it possible to train the neural network and afterwards provide images showing cats or dogs without label and letting the neural network recognise what is shown on the image by providing the answer “cat” or “dog”. Unsupervised Learning For Clustering: Clustering means that the algorithm tries to group together the input data in categories. Example: red, blue, green etc. The category is then the label which is determined for the provided input data. Unsupervised Learning For Association: Association means that the algorithm tries to determine rules which are describing large portions of the data. E.g. poeple that smoke tend to get cancer. 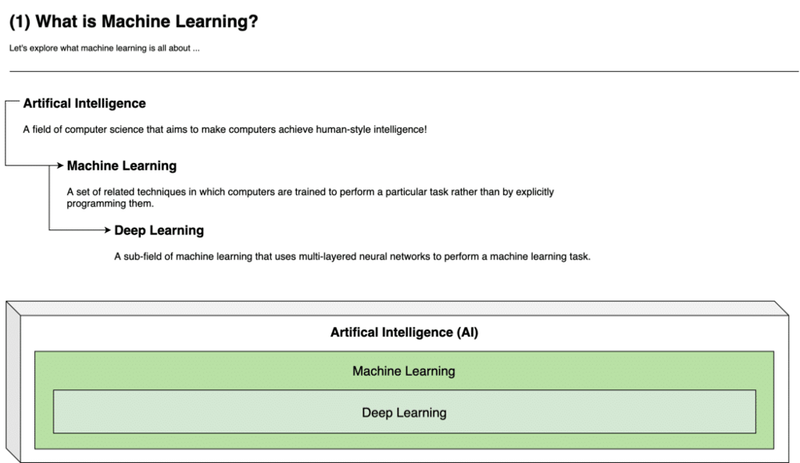 Now that we’ve taken a first look into concepts of Machine Learning you should have a first understanding of what Machine Learning / Deep Learning is. Let’s compare the general approach of Machine Learning to the approach of traditional programming to get a better understanding of the general concept. 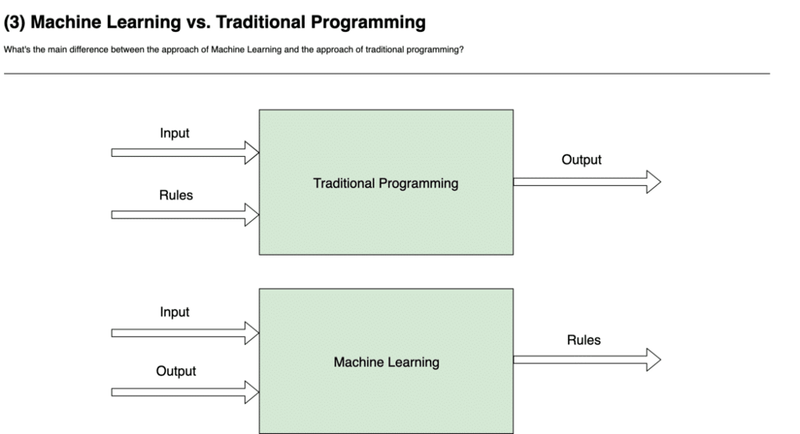 What you can see here is the direct comparison of the approach of traditional programming and the approach which is taken which Machine Learning. In traditional programming we’re used to provide input data and rules in order to implement the program. Usually rules are being used to implement an algorithm which is then processing input data which leads to a certain output. In contrast to that the approach in Machine Learning is a little bit different. In Machine Learning we’re providing input data together with the related output first. Just think of the example with images (input) and the corresponding image labels (output). Based on what is being provided we’re training a neural network which then delivers the rules. With that trained neural network we’re then able to apple the neural network on new input data and it will be able to prodict the output with a certain accuracy. Next, let’s start with the first practical part. In order to write code for Machine Learning we’ll use a framework which is called TensorFlow. 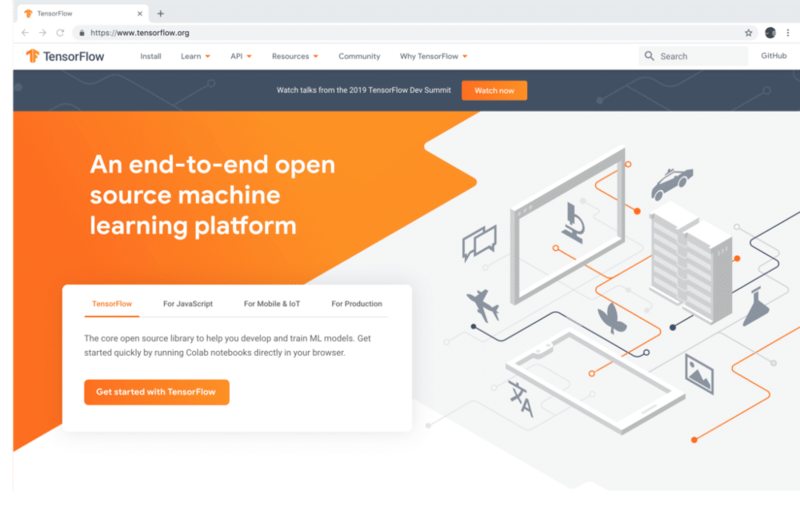 TensorFlow is developed and provided by Google and is an end-to-end open source machine learning platform which is available for many programming languages. Python is a programming language which is easy to learn and easy to read. Even if you’re not a Python expert you’ll be able to follow along the examples. 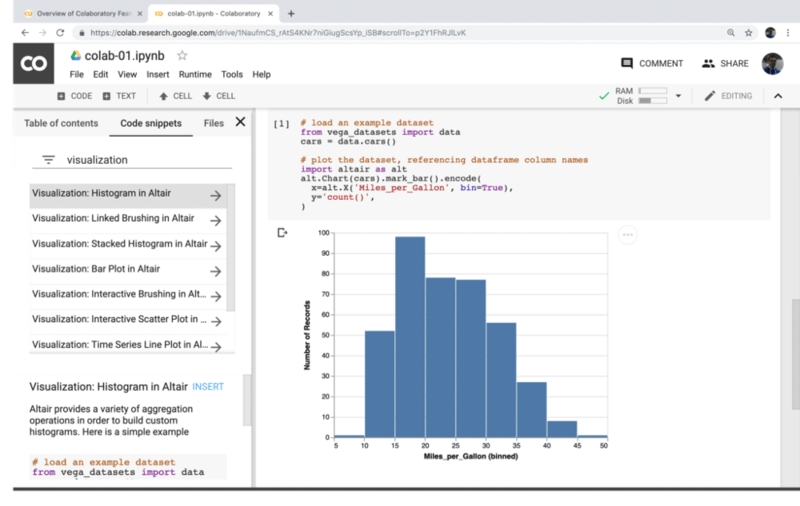 Python offers libraries which makes it easy to deal with large sets of data. This is the prerequisite for any machine learning exercise. 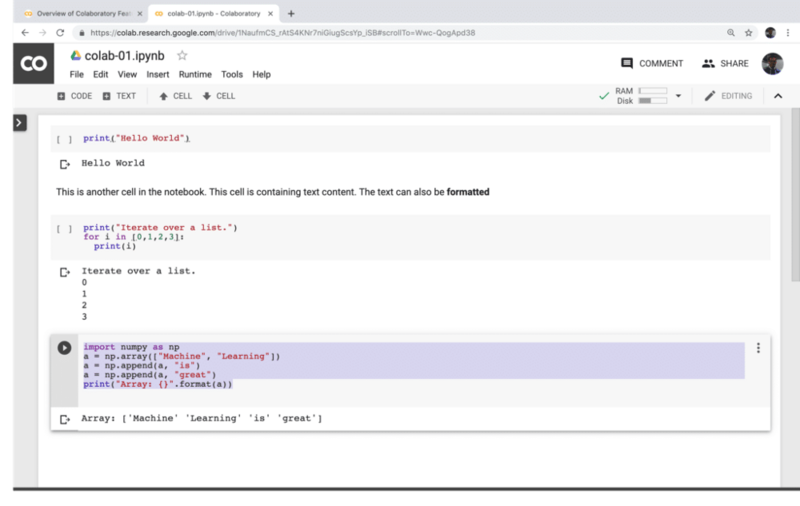 With Google’s Colab cloud environment we’re able to use a fully prepared Python Machine Learning development environment in the cloud which is ready-to-use without needed to setup anything on your local machine first. If you’re new to the Python programming language you can also take a look at https://www.python.org/ where you can find additional information on all aspects of the language. So now, that we know that Python and TensorFlow should be used when implementing our first Machine Learning examples we need to setup a development environment first. 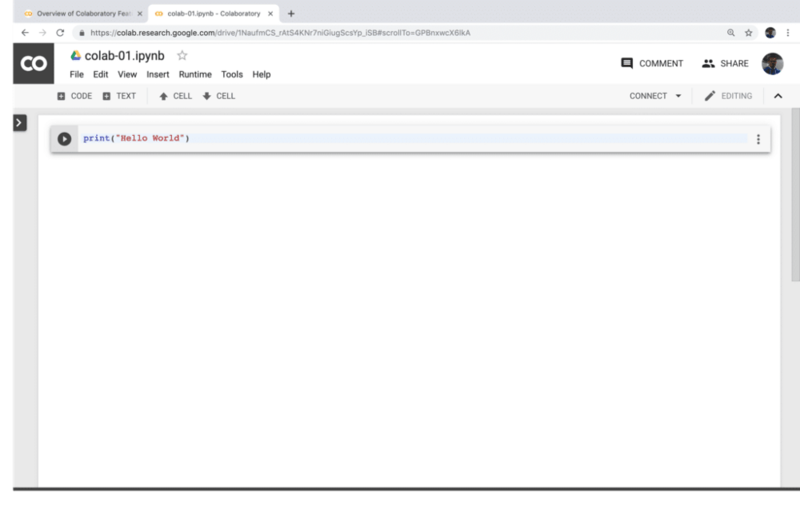 You can setup Jupyter Nodebook (https://jupyter.org/) in order to host your development environment on your local machine and access the Jupyter Nodebook web application in the browser. 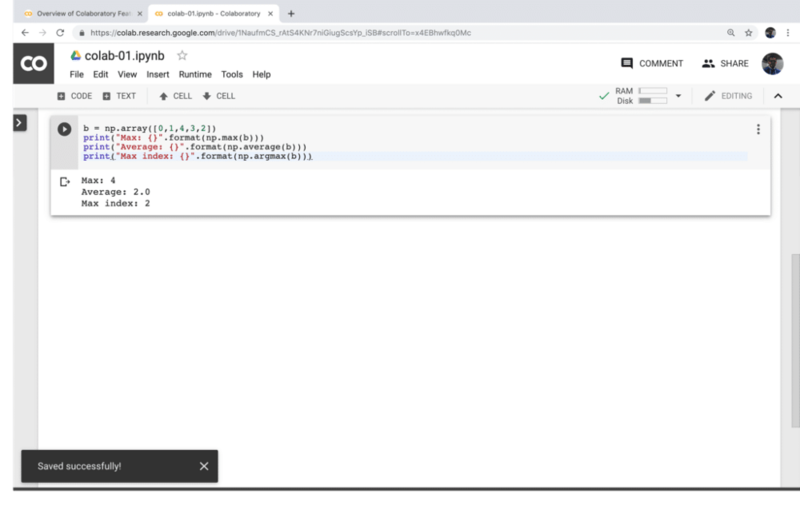 You can use use Google Colaboratory (Colab) which is a Jupyter Notebook-based Python development environment which is provided in the Google Cloud. Colab provides everything what is needed to get started with Machine Learning. 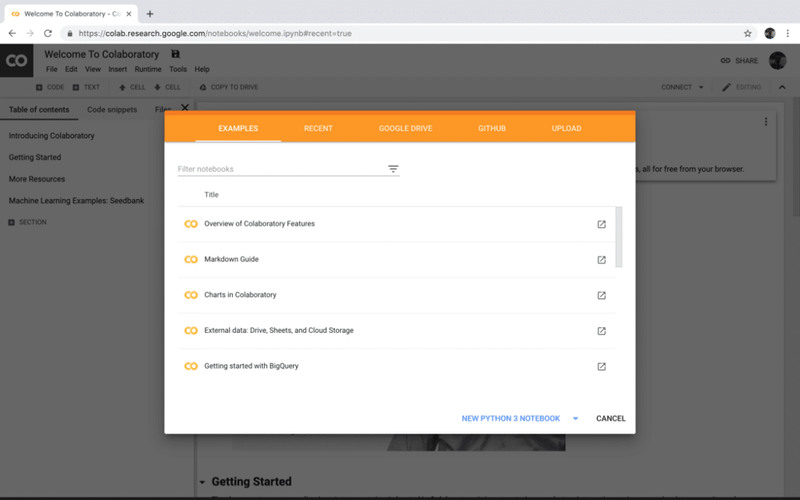 TensorFlow is already pre-installed and as Colab is free to use you just need to sign up with your Google Account to be able to access Colab. For the following exercises we’ll be using Google’s Colab. 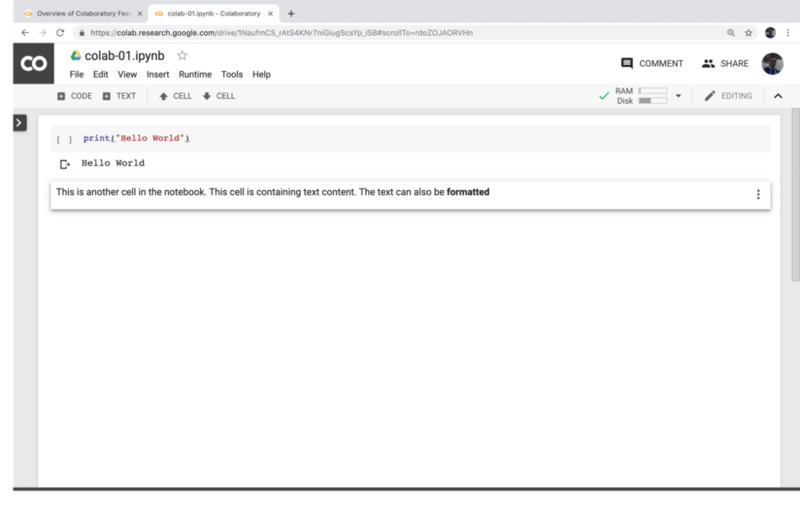 This is the most easiest way to get a access to a full-featured Python-based Machine Learning development environment. Let’s take a closed look at the most important features Colab has to offer. 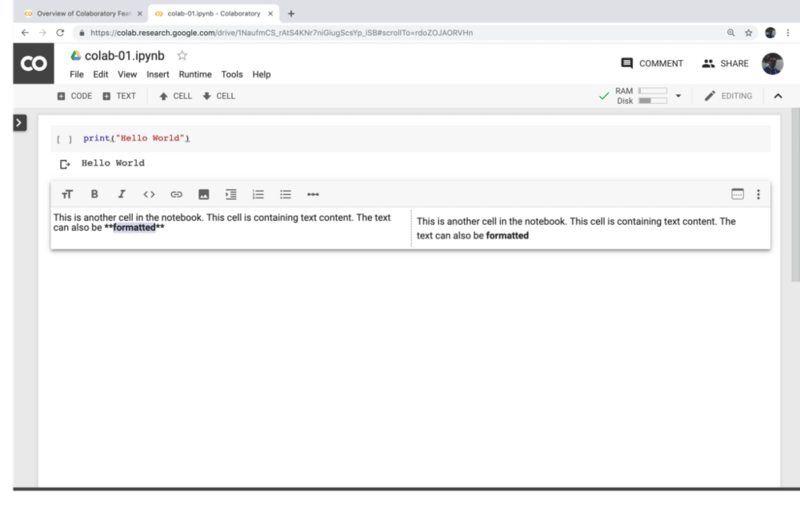 As you can see the cell text content can also be formatted by using the corresponding icons are typing in markdown code. As long as you’re in editing mode the cell is displayed in a split view. The left side of the text cell is containing the markdown text editor and the right side of the cell is showing the resulting output. Now you can see that the output of the cell is containing one line per iteration listing the respective values. Here we’re first making sure that the NumPy library is imported, so that we’re able to use it. 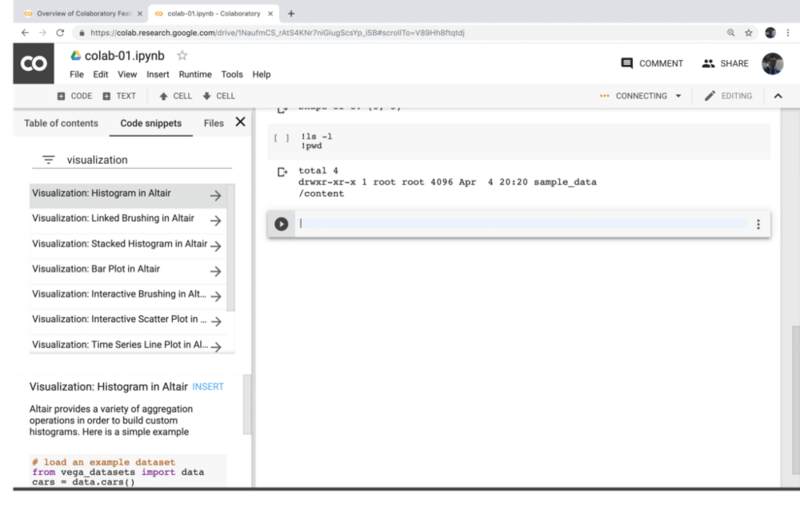 Next we’re creating a new array a by using the NumPy array function. Initially this array is consisting of just two elements and then extended by two more elements (by using the append function). Finally the array is printed out. Once the code cell is being executed you should be able to see the corresponding output right below the code cell. Here we’re first initialising a array with numeric values. Then we’re printing out the maximum value of that array (by using function max), the average of all values included in that array (by using average function) and the index of the maximum value in the array (by using the argmax function). What you can see here is that you need to prefix the line which contains the command with an exclamation mark. 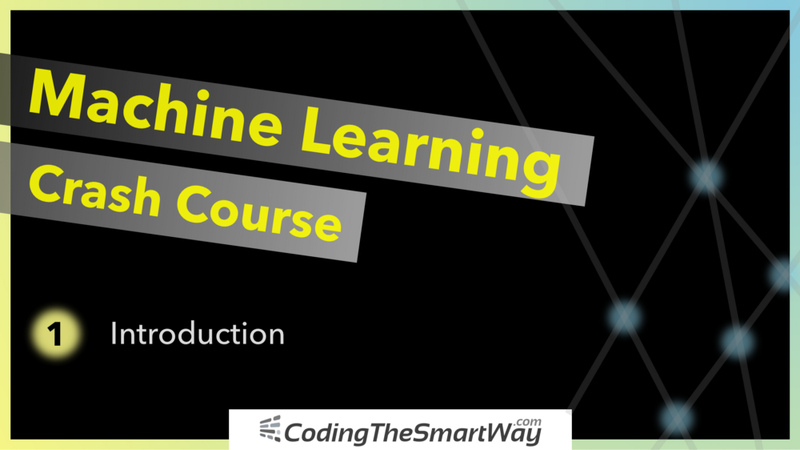 In this first episode of the Machine Learning Crash Course you’ve learned about some basic terminologies and we’ve started to make ourselves familiar with Colab, so that we’re able to use this Python Cloud development environment to start with a first practical Machine Learning project in the next part of this tutorial.